"Hippodrome Theatre" redirects here. For other uses, see Hippodrome (disambiguation). The Hippodrome Theatre also called the New York Hippodrome, was a theater in New York City from 1905 to 1939, located on Sixth Avenue between West 43rd and West 44th Streets in the Theater District of Midtown Manhattan. It was called the world's largest theatre by its builders and had a seating capacity of 5,300, with a 100x200ft (30x61m) stage. The theatre had state-of-the-art theatrical technology, including a rising glass water tank. The Hippodrome was built by Frederick Thompson and Elmer Dundy, creators of the Luna Park amusement park at Coney Island, with the backing of Harry S. Black's U.S. Realty, a dominant real estate and construction company of the time, and was acquired by The Shubert Organization in 1909. In 1933, it was re-opened as the New York Hippodrome cinema, and became the stage for Billy Rose's Jumbo in 1935. Acts which appeared at the Hippodrome included numerous circuses, musical revues, Harry Houdini's disappearing elephant, vaudeville, silent movies such as Neptune's Daughter (1914) and Better Times (1922) and 1930s cinema. The theatre closed in August 1939 for demolition, and in 1952 a large modern office building known as "The Hippodrome Center" (1120 Avenue of the Americas), opened on the site. 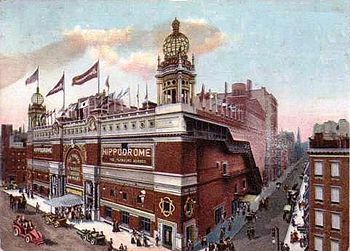 Construction of the Hippodrome began in June 1904, with Frederick Thompson and Jay H. Morgan as architects, and the Fuller Company as the general contractor. Finishing touches were still being put in place days before the April 12, 1905 opening. With a seating capacity of 5300, almost twice that of the Metropolitan Opera's 3000 seats, the gargantuan building is still considered as one of the true wonders of theatre architecture. Its stage was 12 times larger than any Broadway "legit" house and was capable of holding as many as 1,000 performers at a time, or a full-sized circus with elephants and horses – who could be housed in built-in stalls under the stage. It also had an 14-foot (4.3 m) high, 60-foot (18 m) diameter, 8,000-gallon clear glass water tank that could be raised from below the stage by hydraulic pistons for swimming-and-diving shows. The exterior of the red-brick and terra-cotta building was Moorish in style, with two corner towers, each of which was topped by a globe covered in electric lights. The gala opening on April 12, 1905 was completely sold out, with seats being priced at as little as 25 cents in the theatre's "Family Circle", while others had been auctioned off for as much as $575. The performance was a four-hour extravaganza, the first act of which was called A Yankee Circus on Mars, which featured space ships, horses, elephants, acrobats, clowns – including the noted Spanish clown Marceline – a baboon named Coco, an orchestra of 60, hundreds of singers, and 150 dancers performing to Ponchielli's Dance of the Hours. The second act was Andersonville, about the notorious Confederate military prison where many Union soldiers were maltreated. The spectacle depicted the Union raid on the camp, with gunfire, explosions and cavalry troops on horseback swimming across the huge water tank simulating a lake. When Dillingham left in 1923 to pursue other interests, the Hippodrome was leased to Keith-Albee, which hired architect Thomas W. Lamb to turn it into a vaudeville theatre by building a much smaller stage and discarding all of its unique features. The most popular vaudeville artists of the day, including illusionist Harry Houdini, performed at the Hippodrome during its heyday. Others might vanish rabbits, but in 1918, on the brightly lit stage of the Hippodrome, Houdini made a 10,000-pound elephant disappear, creating a sensation. The Hippodrome's huge running costs made it a perennial financial failure, and a series of producers tried and failed to make money from the theatre. It became a location for vaudeville productions in 1923 before being leased for budget opera performances, then finally becoming a sports arena. The next day the Borough President gives them a dinner on the lawn of the Chamber of Commerce up on Tremont Avenue, with special dinner menus for the elephants. It was some show to see all those elephants march up those steps to the table where each elephant had a bale of hay. The[n], the Borough President welcomes the elephants to the Bronx, and the place is just mobbed with people. And that was the worst week's business we ever done in that theatre. In 1925, movies were added to the vaudeville, but within a few years, competition from the newer and more sumptuous movie palaces in the Broadway-Times Square area forced Keith-Albee-Orpheum, which was merged into RKO by May 1928, to sell the theatre. Several attempts to use the Hippodrome for plays and operas failed, and it remained dark until 1935, when producer Billy Rose leased it for his spectacular Rodgers & Hart circus musical, Jumbo, which received favorable reviews but lasted only five months due to the Great Depression. After that, the Hippodrome sputtered through bookings of late-run movies, boxing, wrestling, and jai alai games before being demolished in 1939 as the value of real estate on Sixth Avenue began to escalate. The New York Hippodrome closed on August 16, 1939. The start of World War II delayed re-development, and the Hippodrome site remained vacant until 1952, when it was taken over for a combination office building and parking garage. The building was torn down in 1939, though an office building and parking garage built on the site in 1951-52 owned by Edison Properties uses the name "The Hippodrome Center." Through the 1960s the modern building was the corporate headquarters of the Charter Communications media publishing company. ^ "Raze Old Hippodrome Theater in New York; Will Build 'Taxpayer'". Chicago Tribune. July 9, 1939. Retrieved February 22, 2013. ^ George C. Izenour. Theater Technology. Retrieved February 22, 2013. ^ David Ewen. New complete book of the American musical theater. Retrieved February 22, 2013. ^ Armond Fields. Fred Stone: Circus Performer and Musical Comedy Star. Retrieved February 22, 2013. ^ Sheldon Patinkin (May 20, 2008). "No Legs, No Jokes, No Chance": A History of the American Musical Theater. Books.google.com. Retrieved February 22, 2013. ^ a b c "World Theatres – alphabetical listing", World-Theatres, 2008, webpage: World-theatres. ^ a b Morrison, William (1999). Broadway Theatres: History and Architecture. Dover Books on Architecture. Mineola, New York: Dover Publications. pp. 48–50. ISBN 0-486-40244-4. Wikimedia Commons has media related to New York Hippodrome. This page was last edited on 9 February 2019, at 19:22 (UTC).